Nigerians have been told in several ways by the Federal Government of Nigeria (FG) of how many millions of naira the Nigerian state loses everyday since the goings-on struggle by the alleged militants in the Niger Delta. This is to say that FG means that the so-called militants are bankrolling the economy of the country? And these losses are made in the crude oil sector. I ask, what happens to other natural resources in the North and the West abandoned for years for the gluttonous pursuit of crude oil in the Niger Delta, a region left the in fate it inherited from Adam and Eve? The attack of Niger Deltans by the men of the Joint Task Force (JTF) has shown how wicked the Nigerian state could be. Were innocent civilians not killed in that war? But JTF is only mourning for its alleged 18 soldiers whose whereabouts were yet to be known. Wouldn't the FG tell the world how many civilians, and inclusively, the so-called militants that were killed in that war? After all, the militants are Nigerians. Or, were they imported? 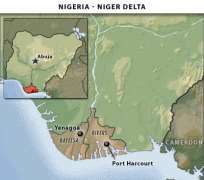 Perhaps, the number of the killed Nigerians in the Niger Delta genocide is not important? The JTF keeps on telling us that what they did in the Niger Delta of Delta State on that 'evil' Sunday was a 'mission' to fish the militants out? But eyewitnesses in many Nigerian newspapers are of the contrary opinion: civilians were killed in numerical. Why on earth should the FG deplore soldiers to perform the worst of genocide in the Niger Delta and keeps on telling us that we are a democratic state? Is Nigeria not a democratic state where the rule of law doesn't matter if that dastardly act could be carried out against a people who were not entirely militants? Or, were they all militants since one (Dis) Hon. Balla Na'Allah was quoted in the newspapers as saying that Nigeria should sacrifice 20 million Nigerians for the rest 120 million people to be comfy? While his colleague in the House of Scandal, (Dis) Hon. Dimeji Bankole was quoted as saying that what happened in the Niger Delta was a peace keep; and I say may such peace keep come to his people and himself, where soldiers would come from the up with 'fighters', warships, and land soldiers to curb criminals in his area. Amen. Since this incidence, I have been thoughtful if this is one of the 7 point agenda of the president. Perhaps, it is now 8 point agenda. All was for the quest of crude oil in the Niger Delta that crude people were sent to kill innocent people? One is poised to ask what has the FG been doing with the trillions of naira it generates from revenues if up till over 48 yrs of independence the gap between the rich and the poor is like the gap between the now devastated indigenes of Gberamatu and the men of the JTF? Imagine that a recent report by the United Nations Office on Drugs and Crimes (UNODC) shamed many of us about how Nigeria has been losing $10 bn annually to treasury looting, amounting to $ 490 billion lost to looters in Nigeria's 49 years of independence. Who were these treasury looters, if not politicians? And no one has been heard killed of even been jailed in Nigeria for looting public money? It is disappointing. Was it not a shame that, “While Indonesia which shares so many similarities with Nigeria is actually developing rapidly despite the presence of corruption, Nigeria can't boast of such probably because of the huge amount of money being looted outside the country”? reports UNODC. Now, can the alleged money the FG says it loses daily in the Niger Delta as a result of militancy be measured with the billions of US dollars Nigeria has been indicted of losing yearly in the hands of the treasury looters? And no one has crated a state of emergency in EFCC or ICPC for failing to probe or stem these treasury looters. It is bizarre! This Niger Delta genocide shouldn't stop there; it has to be extended to all the facets of public offices that have looted our collective wealth and sensibility, which has kept Nigeria still clambering in the messy mud of underdeveloped or undeveloped world. Does it not take absolute morality to expose absolute immorality? I stand being corrected that if what the FG is looking for in the Niger Delta are militants, then FG is the worst of militant ever heard in the history of the world. Does Nigerians have pipe born water, good roads, good schools, good hospitals, daily food on the table, security, rights for their franchise? Etc. yet we have a government. Nothing seems to be working out in Nigeria except 'corruption' and this is practiced in the high heavens among the politicians who are now deploring soldiers to kill the Niger Deltans. Did President Yar'Adua not say that even the election that brought him to power was marred? And yet, he is declining the electoral reform? Even the re-branding exercise is fraud because the FG is selling what Nigeria (not Nigerians) is not to the international community. What is then militancy in the Nigerian parlance if not disobedience to order? And this is rife among government officials.